Nikolay Evdakov is the newest "red" Full Tilt Poker pro, recently inking a sponsorship deal with the second largest online poker room in the world. Who is Nikolay Evdakov? He was an unknown player before this year's World Series of Poker, but not anymore. Evdakov broke the record for most cashes in a single World Series of Poker year, shattering the old mark of eight cashes and re-writing the record books by cashing in a remarkable ten events. Even more remarkable is the fact that despite cashing in a remarkable ten events this year, Evdakov didn't make the final table even once. 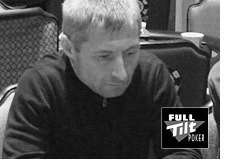 I understand what Full Tilt was thinking when they signed Evdakov - he cashed ten times in this year's World Series of Poker, so he will likely get a fair bit of time on TV. We like to have everyone who appears on a televised poker show under contract, so let's ink him to a deal. 1. Evdakov is NOT a popular or likable guy. I can almost guarantee that Evdakov will be portrayed in a negative light if he is given any serious TV time during this year's broadcast of the World Series of Poker on ESPN. Evdakov got into more skirmishes with other players than possibly any other player at this year's World Series of Poker. I don't know anybody that actually enjoyed playing with him. 2. Is Evdakov a one-hit wonder? He doesn't seem like an extremely strong poker player. Sure he cashed in ten events this year, but he didn't win a bracelet, and didn't even make the final table of any of the events that he cashed in. Ten cashes and no final tables? Seems suspect to me. Even if he gets some time on TV, I don't believe that he signed his deal with Full Tilt until after the World Series of Poker had concluded, so the online poker room won't benefit from him being on TV. 3. Does Full Tilt start to lose credibility when it employs a policy of signing everyone that it possibly can to sponsorship deals? Does Evdakov get lost in the crowd of the other 100+ players that are currently signed to deals with Full Tilt? To me, this signing is a head-scratcher.